Time to plant the window boxes and I have a ton of them! One of my favorite things to plant in them is nasturtium seeds. They were my Grandmothers favorite flower. I get the trailing kind. so you do have to watch them closely for that. In hopes that they will look like the one in the picture! I love how full they are and the colors are so vibrant! The seedlings should start popping up in a little under 2 weeks! Good luck with your window boxes !! these are looking really sharp-so springie! I've been doing this today, and all last week! Finally done! They are full of fir trees and tiger ferns, pale pink verbena and ivy geraniums... and loads of English ivy. 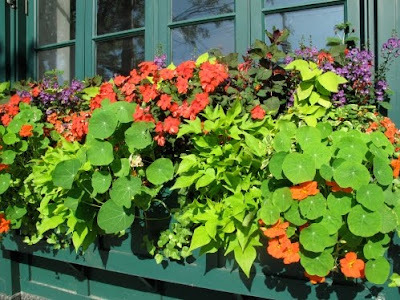 I adore window boxes! One of my favorite things to plant is sweet potato vine. Here in the deep south it grows and thrives until late winter, usually until November or December. Maybe I'll get my wall planters (in my courtyard and privacy fence) planted this weekend, thanks for the inspiration! I do declare, Spring has sprung! I adore sweet potato vine! That bright, chartreusey color looks smashing with just about everything. I need to get busy planting my one measly box! The already look great - love the progress of flowers and plants during the entire season. Can't wait to see your window boxes! fun! Hi Melanie!! love how your window looks like with all those wonderful flowers!!! I'm getting into gardening as I've never done. So Pretty, and thanks for the tips on what to plant! Hi Melanie! Your window boxes are beautiful! I'm building my new house and I'm now into gardening as I've never tought I will be! I think it's that because I will also have a garden..and I'm starting to think about it as a "room" to decorate, but with flowers! Have fun planting your window boxes! Definitely post a picture. Hi! This is my first time leaving a comment. 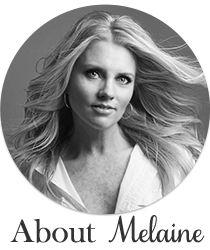 I pop in on your blog often though and wanted to tell you that I really enjoy it. You give me much needed inspiration some days. :) I love the window box! I planted mine on the deck early this year but am not happy with them. I was getting ready to give them a make-over today and like I said...you've inspired me once again! Off to get my garden tools right now! Good luck. It sounds like it will look amazing. Love flowers and I love window boxes! I don't have any but am getting some plants started...and I bought a huge pot of red geraniums yesterday. LOVE them!